Has pulse dialing ever worked? So whats still out there that uses pulse dialing?? Pulse is as dead as the Do-Do. Does that mean I have to retire the Strowger switch I use in my home telephone network? Will I have to hire an operator to run my switchboard? Ahhh. How far we have come. I remember my first auto dial telepone. It used cards to store the numbers! You can use it to answer calls. Hold it right there, fellas. NOBODY* has to give up their beloved pulse-dial devices. ... and scroll down a bit. * = Unless you're a MagicJack user. They claim it doesn't work with MJ. I googled "pulse to tone converter" to find this. PS. Southsound, that thing's gonna give me complicated nightmares for a while. Hey, that's pretty cool! Didn't know they made those. I totally forgot I have a Canon handheld DTMF dialer - it's like a calculator, but sends out dtmf tones. 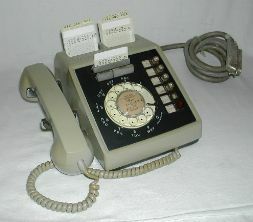 Hold it up to the speaker of the handset, then either whip out a phonebook entry, or dial manually. pretty cool actually. But I like the above-mentioned tone converter better - that way you can still use the rotary dial. caseybea wrote: +1 for the find! PS. I like your avatar. Ooch! Aye. southsound wrote: Ahhh. How far we have come. I remember my first auto dial telepone. It used cards to store the numbers!